Looking for some spring break ideas that will bring your family together and won’t break your budget? 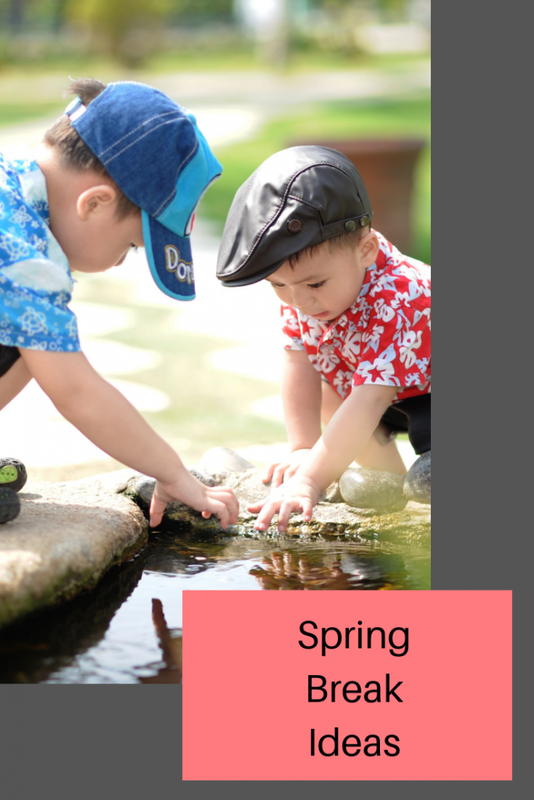 You don’t have to take a trip to make the spring break fun for your kids. With some advance planning and creativity, you can make the Easter holidays as much fun as a week at the beach. If you’re staying home during, think of the outings and activities you can’t fit into your school-day schedule and get them done. Visit the places you can’t get to on weekends and do projects your regular schedule won’t allow. camp out in the garden on Wild West Day, do some stargazing on Outer Space Day, and go for a fossil hunt on Dinosaur Day. Have a Birthday Day, when it’s a special day for everybody; organise a gift exchange and have cake for everyone. Spring is the perfect time to start thinking about your garden. Let your children choose a small piece of ground in the back yard and dig it out into their very own garden. Let them put in a border with bricks or rocks and plant what the season allows. Start some seeds in potting soil in Styrofoam cups indoors so they can plant them outside when the weather gets warmer. Children’s gardening and planting projects are great lessons in science and math. What’s within driving distance to where you live? Get out a map and let the whole family look at what’s nearby. If you are looking for a day out, Little Ankle Biters are a website run by Mums for parents to find local small businesses and read reviews of an abundance of attractions throughout the uk. Schedule some trips to museums, factory tours, stately homes and other local offerings. Call your church, local food banks, check local Facebook groups or town hall to find out what volunteer opportunities are available. Sign up to do a week’s worth of laundry at a homeless shelter, serve dinners at a soup kitchen, or help out in a food bank. Prepare the biggest and best Easter celebration ever. Make natural dyes for colouring Easter eggs, do lots of Easter crafts, and make your own Easter baskets. These are some lovely ideas! I really want to start planting a nice garden, but will have to wait until next year as I am heavily pregnant, boo haha! I can’t wait for the Easter holidays! Never too old for an egg hunt! These are some absolutely wonderful ideas for things to do at Easter. I absolutely cannot believe how close it is now! The bunny is coming. Such a fun list of things to do! I love the idea of planting a garden. Such lovely ideas. Camping in the garden sounds lovely!